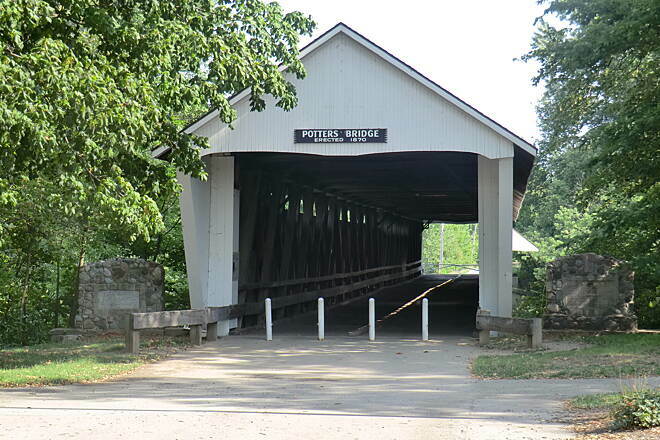 Trail end points: Potter's Bridge Park off Allisonville Ave. and N. 8th St. and Logan St.; Morse Park off E. 196th St.
A restored covered bridge that dates back to 1837 is the centerpiece of Noblesville’s White River Greenway, which opened in 1999. The level to gently rolling asphalt trail, which hugs the banks of the White River, runs through woodland and prairie habitats and includes rest benches at scenic overlooks. 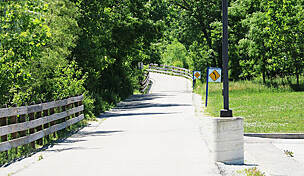 The trail also passes through Forest Park, where trail users have the choice to continue south into the downtown area of Noblesville or to continue northwest on the trail along Lakeview Drive, Hague Road and E. 196th Street to access Morse Lake and the popular park located at its southern shore. 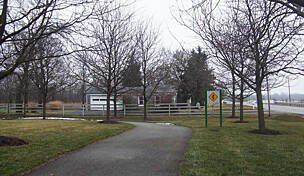 Ample, well-lit and free parking is available at the trailhead in Potter’s Bridge Park, accessed from the intersection of Allisonville Avenue and Covered Bridge Way in Noblesville. 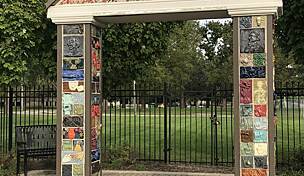 Additional parking can be found in Forest Park on Forest Park Drive just west of Cicero Road/State Route 19 and in Morse Park off E. 196th Street. This is the first trail we have done that we drove a distance to in our vehicle, had to park, and find the trailhead. 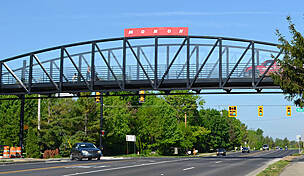 The directions from the site said to turn on Conner Street in Noblesville to get to the trail. That direction is misleading as Conner Street is not marked as such from Highway 37. It is marked Highway 32. 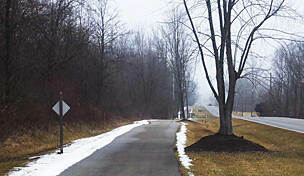 The beginning of the trail is not well marked from the town of Noblesville. We asked a person and were finally off. The trail through Forest Park is nice. I would avoid it on weekends though as there were lots of people walking dogs, kids, etc. 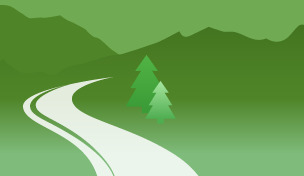 There are a couple of hills that are a challenge to a novice, but lots of trees and nice scenery. Once out of the park the ride is nice for a while but somehow we did not make a correct turn and ended up along Hague Road until we reached 196th street. The trail ended and we turned back. Traffic on Hague Road beside the trail was quite intense and noisy. We never got to Potters bridge nor the park there. 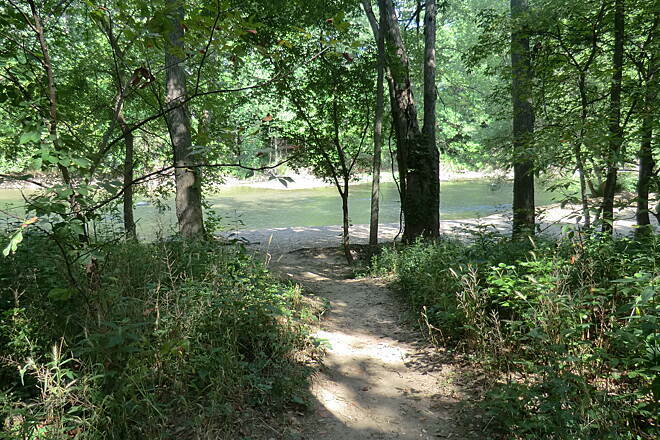 That will have to be for another day and we will start from the opposite end of the trail from Noblesville. Good ride, but not quite what we expected. 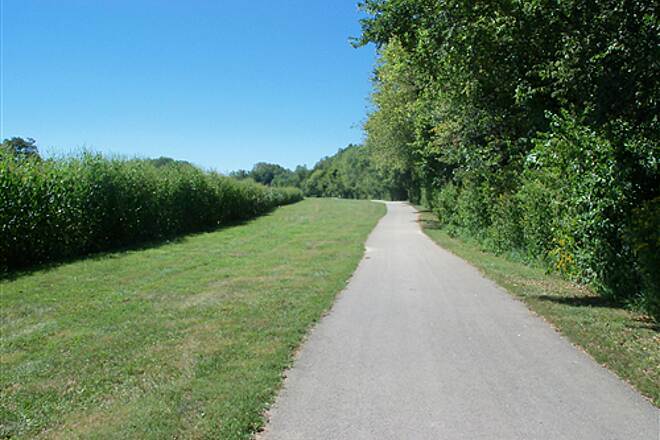 The actual White River Greenway Trail is not long, but it is a nice trail that includes parklands, riverside woodlands, and a section that is sandwiched between the river and farmland. The wooded section is fun to ride because it is curvy with some small elevation changes. The entire trail has several park benches and information signs. 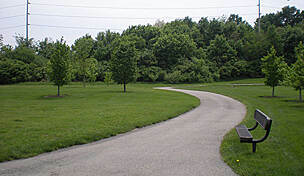 Another paved trail connects to the Greenway Trail in Forrest Park. There are some rolling hills, but it is mostly flat. 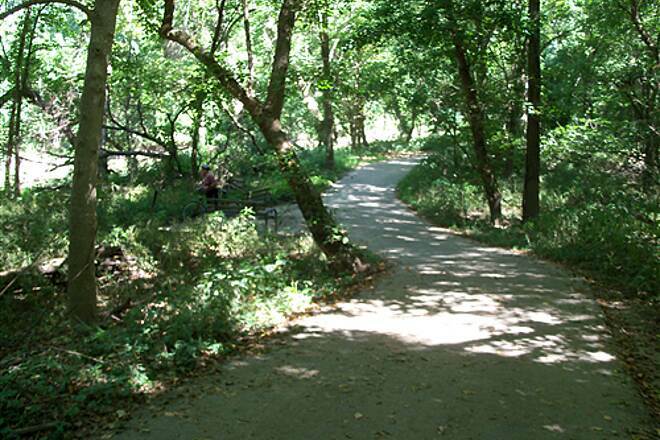 This trail heads west to Hague Road and continues north to Morse Lake Beach Park or south to State Road 32. 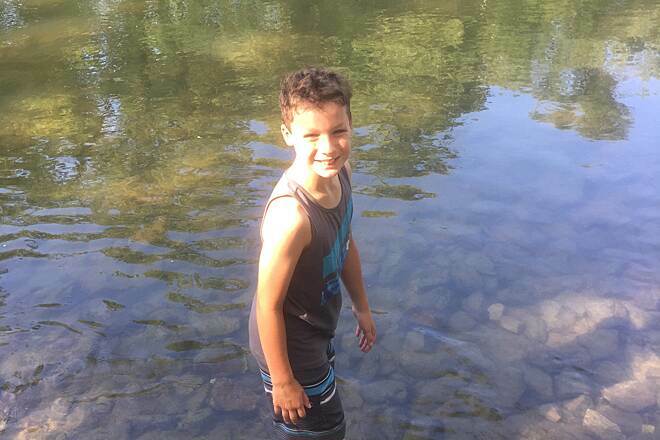 The north branch passes by some housing additons and ends up at the Beach Park. 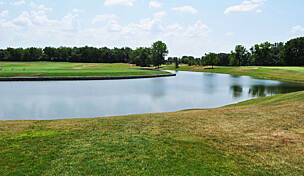 The south branch is more prairie-like and crosses a few streams. 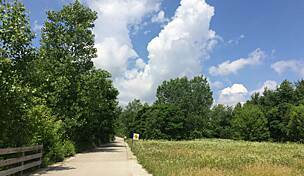 This trail system also connects into a trail that runs along Cicero Creek and into a couple of housing additioins. I would recommend this entire network of trails. A trailside sign with a map of the trails and distances is located in Forrest Park near the aquatic center. 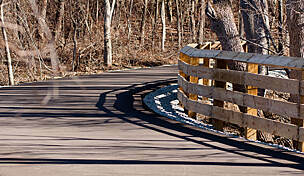 "This is a great trail for biking, running and walking. 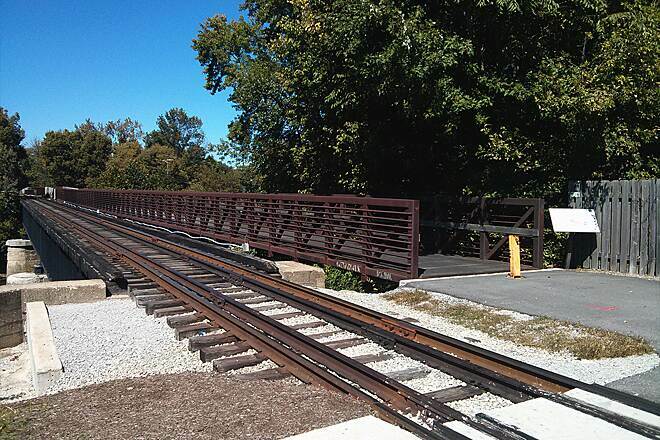 It has wonderful views of Forest Park and Potters Covered Bridge. "